Send a celebration wine basket. 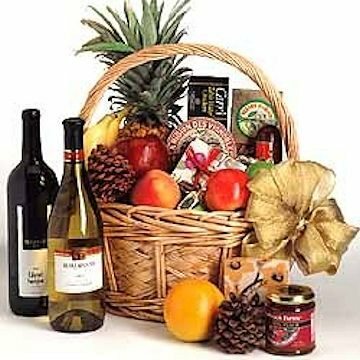 This basket of wine, fruit, and gourmet food is the perfect culinary gift. Choose either Chardonnay or Merlot to accompany the fine fruits and gourmet. Each bottle of wine is individually selected by a trained wine connoisseur to ensure maximum quality. The fruits may include exotic and domestic fruits such as Pineapples, Bananas, Apples, Oranges, Kiwis and Tangerines. The gourmet items will include savory delights such as Cheese, Nuts, Sausage, Crackers, and Hard Candies. The basket is prepared by a skilled designer with a stylish bow to finish this beautiful gift. Basket and fruit selection may vary depending on the geographic location.